It was Henry McCleary who first caught the vision. Where others saw nothing but trees and hills, Henry saw the perfect setting for crafting doors. Drawing from the inspiring beauty of the Pacific Northwest, he built a door business from scratch that would earn a reputation for meticulous quality and superb design. Today, nearly a century later, that vision still drives Simpson. 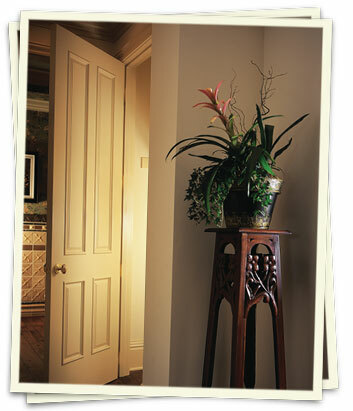 As one of the oldest continuously operating door plants anywhere, Simpson boasts a rich heritage. And the pioneering spirit is still with Simpson, as they integrate state-of-the-art technology with their 100 years of know-how. You can count on Simpson services you’ve come to expect: Quick lead times. Simpson Certified Quality craftsmanship. Rigorous inspections prior to any order being shipped. And meticulous packaging preparations to ensure that your custom door arrives safely and in perfect condition. Simpson made creating a unique, signature door a smooth, simple process. It all begins with a few key selections you determine are best for your needs. Then, using the design, species, and dimensions that you specify, Simpson can create your masterpiece. Whether Simpson construct your door with veneer and engineered core components or laminated lumber, they will incorporate both technology and beauty into your individual design. Thanks to the advanced technology in Simpson manufacturing process, they can now accept your sketches and descriptions and turn them into reality. Simply provide us with the design concept you have in mind, and our engineers will determine how to translate it into a truly one-of-a-kind door. Once you have a design, you can then select the species of wood that is the best match, whether a classic favorite or something more exotic. We work with dozens of wood species from around the world, including: fir, hemlock, pine, knotty pine, cherry, maple, walnut, oak, mahogany, knotty alder, poplar, birch and white birch. Whatever the species used in Simpson Custom Doors, it must meet strict grading standards before being accepted. For instance, we use only color matched Cherry that is all heart with no sap. The beauty of cathedral grain patterns are retained for parts over 26″ long and 4″ wide. Veneered panels are slip matched to further enhance the consistent appearance. Maple is another good example, since we only use hard rock maple that is uniform in color. No matter what wood species you select, each piece of wood is carefully examined to ensure it will live up to the reputation Simpson has for quality and performance. 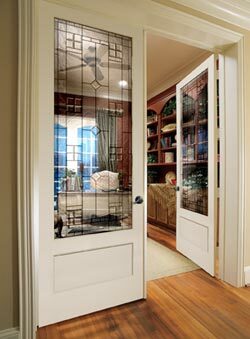 Some homes require doors with unusual dimensions. 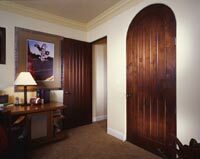 We can construct doors to meet a wide variety of sizes, up to 5′ wide and 2-1/4″ thick. Arch top doors and other unique shapes are also available. It’s the final touches that make all the difference when creating your own door. 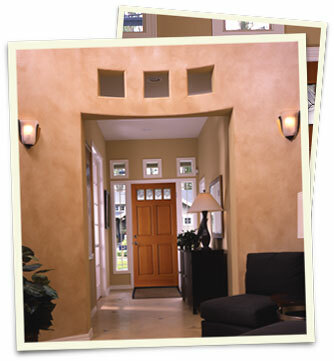 Dress up your door with decorative moulding accents or special panel treatments. 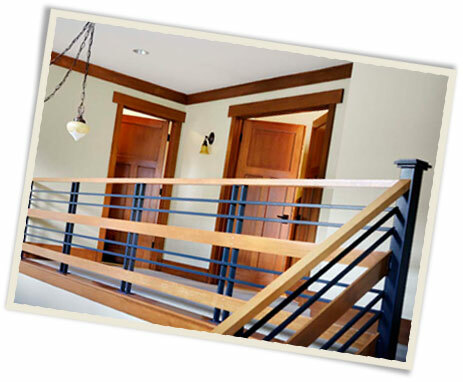 Or match your home’s current millwork details to create architectural synergy through your home. If you need an idea of where to get started, view the following sample of decorative accents. You may discover something that will work perfect for your home. Simpson Artist Collection®—an anthology of unique, limited-edition door designs by select artists. Simpson Artist Collection doors are created with the highest level of craftsmanship you’d expect from Simpson, and they are magnificently complemented by a talented artist’s touch. Simpson Contemporary Doors deliver clean lines and distinctive styles, all with the quality and craftsmanship you expect from us. So embrace the bold architectural features of modernism without sacrificing the warmth and durability of wood. 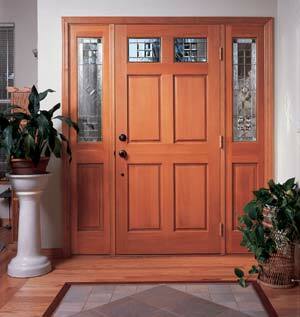 Available in virtually any wood species, there are 36 exterior door designs to choose from. 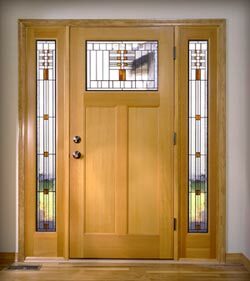 Once you have found the Craftsman design that is right for you, consider adding a Simpson Craftsman sidelight, transom or dentil shelf. Nature provides the beautiful raw material – Simpson design and craftsmanship provides the rest. 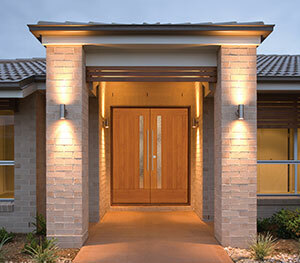 State-of-the-art technology goes into every Simpson Mastermark® door, assuring you of outstanding performance. For example, the patented Innerbond® panels carry a lifetime warranty against splitting through. Engineered components resist warping and twisting. 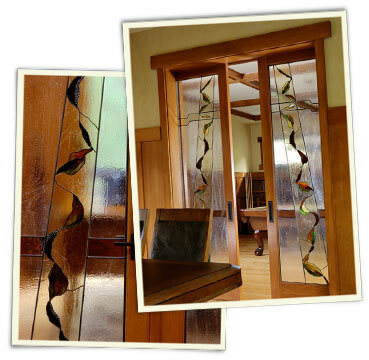 And triple glazed leaded glass inserts reduce heat loss and enhance appearance. If you don’t see what you looking for, just ask! A consistent, traditional look throughout your home not only adds character, but also adds to neighbor-envy (and overall value). 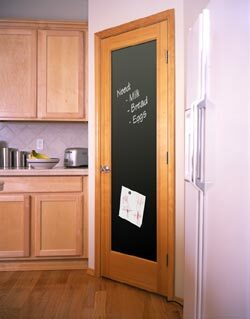 These doors are available in raised, flat, or chalkboard panels, as well as bi-fold designs. Simpson’s new Decorative French Interior Doors have been designed to satisfy the growing demand for architectural continuity throughout the home. 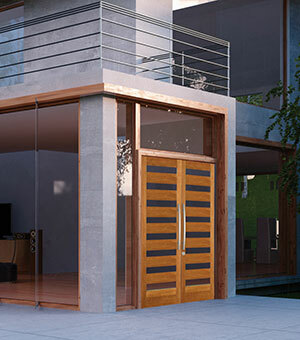 Now homeowners can order interior doors to match some of our most popular exterior door designs. The expansion adds 12 new full-lite designs in your choice of Douglas Fir, Western Hemlock or a factory-primed option from our Redi-Prime® Series. Each design incorporates 5/8″ thick, triple-glazed insulated decorative glass that can be ordered with black, silver or brass caming. 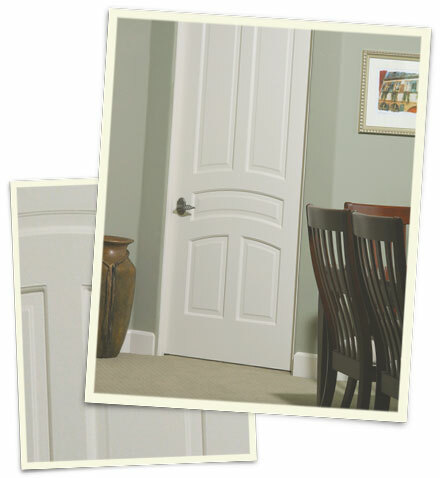 Simpson revolutionary Ovation Layered Panel Doors are precision crafted from components made of medium density fiberboard. This stable material is an environmentally friendly substrate that will not split or warp and provides a smooth, paintable surface. 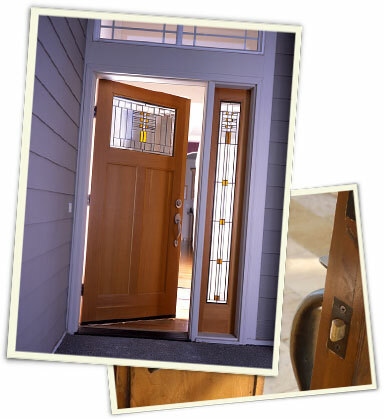 Made in the USA, these doors feature the patent pending Integra-Lock™ wood edge, which keys and bonds each door. This unique design feature will not allow the wood edge to pull out and ensures screw-holding power. 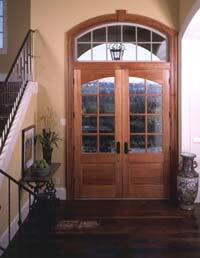 The Ovation Door is offered in a wide variety of styles to fit many different home styles. There are over 132 standard designs plus unlimited custom design flexibility for homeowners and builders to choose from. Performance, styling and value come packaged together in our Infinity doors. Part of Simpson’s Primed Package, Infinity doors allow unlimited design flexibility.